We all know what inflammation, the body's systemic response to infection or injury, feels like: achy joints and fatigue, for example. What does inflammation in the context of depression look like inside the brain? 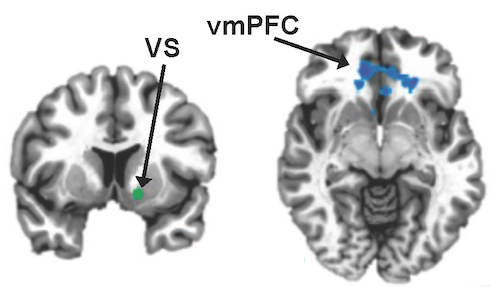 Emory researchers have found that high inflammation is linked to a "failure to communicate" between two parts of the brain: the ventral striatum (VS, vertical cross section) and the ventromedial prefrontal cortex (vmPFC, horizontal). Co-first author, research associate Zhihao Li, PhD is now at Shenzhen University. Other Emory co-authors include Andrew H. Miller, MD, professor of psychiatry and behavioral sciences at Emory University School of Medicine and Winship Cancer Institute, Ebrahim Haroon, MD, assistant professor of psychiatry and behavioral sciences at Emory University School of Medicine, and Xiaoping Hu, PhD, professor in the Wallace H. Coulter Department of Biomedical Engineering at Georgia Tech and Emory. The research in the paper was supported by the National Institute of Mental Health (R01MH087604, K23MH091254), the Atlanta Clinical and Translational Science Institute and the Brain and Behavioral Research Foundation.